Sponsored by Hansells Solicitors and Financial AdvisersThis prestigious award was given to a business, large or small, that has given significant support in whatever way, to an artist, creative project, venue or arts-based initiative in Norfolk. Congratulations to Adnams who won this category. Sponsored by Valerie KurznerThis award has been created in memory of one of Norfolk’s most loved arts and entertainment entrepreneurs, Hy Kurzner. Hy was responsible for creating a thriving arts scene in Norwich from the late 70s through to the early 90s, particularly in the Tombland area of the city with his jazz venue Boswells, nightclub Hys and restaurant Pizza One Pancake Too. 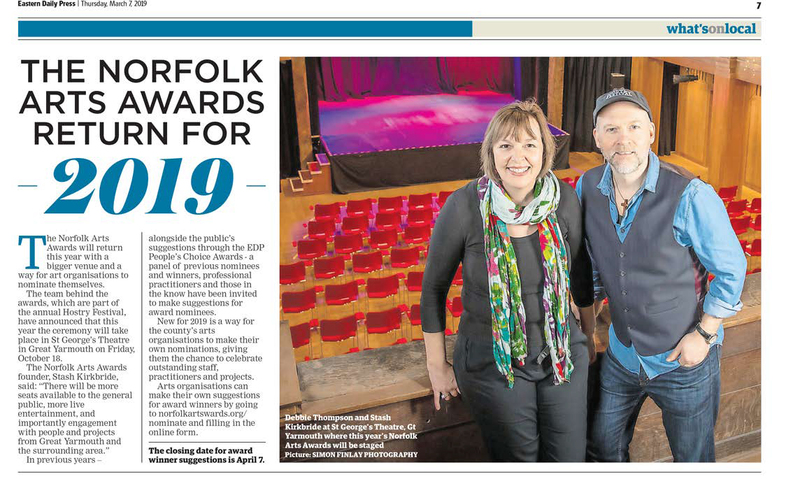 This award will be given to an artist, venue or arts organisation that has been ‘entrepreneurial’ in establishing a new and successful artistic enterprise in Norfolk. Congratulations to the Norwich Print Fair who won this category. Peter Barrow is Executive Producer of The Hostry Festival and is providing this very special bursary award. This award was given to an individual who is starting out on a career in the arts and who has already demonstrated exceptional ability, drive and passion for their craft. The Best Newcomer Bursary Award for 2015 will focus on young actors and actresses between the ages of 16 and 24 years. The bursary includes professional career advice, training and placement opportunities, a professionally created website, a role in the Hostry Festival 2016 main production and a financial award. Congratulations to Grace Leeder who won this category. Sponsored by the Maddermaket Theatre. 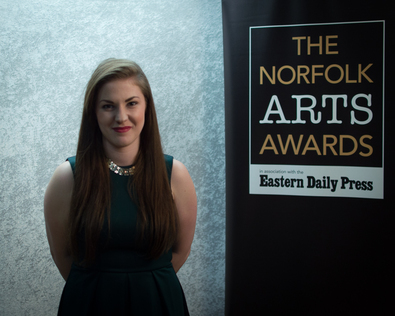 This award was given to an individual, venue or arts organisation that has contributed significantly to Norfolk’s arts scene over a long period of time. Congratulations to Richard White who won this category. Awarded to an actor or actress, a theatre company or a theatre venue, that has produced exceptional work within the last twelve months. Congratulations to The Sewell Barn Theatre who won this category. Awarded to a musician, band, ensemble, duo, orchestra, quartet, composer, music venue or music organisation, that has produced exceptional work within the last twelve months. Congratulations to the Norwich Philharmonic Society who won this category. Awarded to an exceptional individual, group, specific project, venue or organisation, that has enabled the local community to take part in the arts. This may be through volunteering, participation in a workshop, performance or event. Congratulations to Sistema who won this category. Awarded to a dancer, choreographer, dance company, dance venue or dance organisation, musical theatre performer, musical theatre company or producer that has produced exceptional work within the last twelve months. Congratulations to Pasco-Q Kevlin who won this category. Awarded to a fashion or costume designer, costume or fashion house, a promoter of local fashion or costume design, a costume or fashion festical or event, that has produced exceptional work within the last twelve months. Congratulations to Kirsten Wythe who won this category. Awarded to an artist, a group of artists, a collection, gallery, studios, or visual arts organisation, that has produced exceptional work within the last twelve months. Congratulations to Toni Lawton who won this category. Awarded to a journalist, presenter, editor, columnist, radio station or television company, reviewer, film-maker, or publication, that has produced exceptional work within the field of the arts within the last twelve months. Congratulations to BBC Voices who won this category. Awarded to a local writer of fiction, poetry, biography, non-fiction; a wrting group or organisation promoting and writing locally; a bookshop, wholesaler, publisher or agent promoting the work of local writers. Congratulations to Alan Marshall and Mascot media who won this category. A new award for 2015 celebrating Norfolk work extending beyond the region. The New Norfolk Icon Award, created to celebrate artists who represent Norfolk outside the county. Caroline’s Norfolk credentials and extraordinary popularity and success on the BBC’s Strictly Come Dancing, makes a the perfect winner of this new award for 2015. Caroline sent us a film of her accepting the award from her rehearsals at the TV studios with cheeky Ollie Murs looking on! Congratulations to Carroline Flack who won this award.